It has now been moved to a PBS educational website with full open access. Click above to watch the full 55minute TV documentary movie. Randolph Langenbach appears in the last 10 minutes of the 53 minute program. 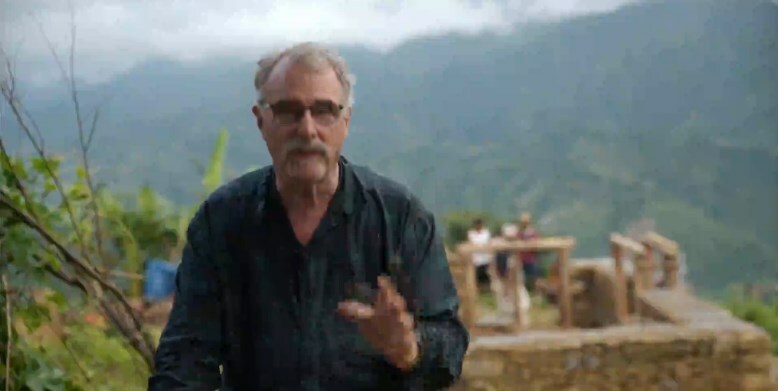 Go to minute 43 to see him in the Hanuman Dhoka Palace with Kai Weise, architect from Nepal, and at minute 46 to see him in the remote village of Mankhu in the Himalayan foothills, helping to reconstruct a home reinforced with Gabion Bands. to open a 9 page PDF description of the HRRP Meeting in which this lecture was a part. This document includes lengthy description of each of the talks including that by Langenbach. 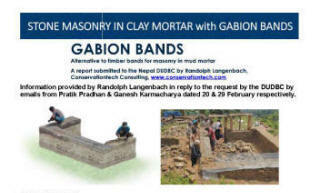 It includes as well a 3 page description of the talk by Ramesh Guragain of NSET, and two pages on a talk by Loren Lockwood about research on fiber reinforcement of earthen mortar for rubble stone walls by Oxford-Brooks University. The first draft report was first written 3 weeks after the April 25 earthquake proposing a technology that could aid in the reconstruction of rural stone dwellings remote from access to imported materials, and suffering a shortage of good quality timber. 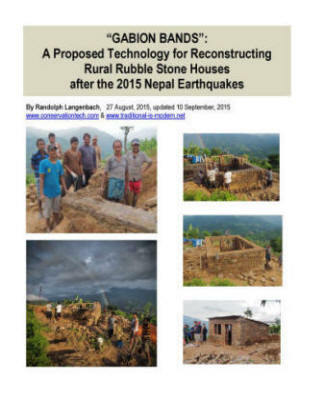 This copy of the report has been edited and expanded after the August field trip to rural Nepal to organize the construction of a demonstration house with Gabion Bands under the direction of filmmakers Skydoor Films for a WGBH "NOVA" documentary on the earthquake. Owen Geiger is the former Director of Builders Without Borders and Founder and Director of the Geiger Research Institute of Sustainable Building (www.grisb.org). 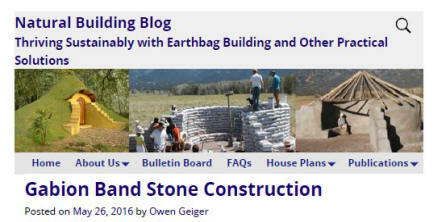 He is an author, engineer and licensed contractor specializing in strawbale construction, earthbag and other types of sustainable building. for inclusion in the DUDBC "Design Catalogue for Reconstruction of Earthquake Resistant Houses"
This project is the first school constructed with Gabion Bands. Chupar is in Nuwakot District. The project was spearheaded by JOHN VAVRUSKA, former Peace Corps Volunteer to Nepal, and was carried out with the leadership of John Vavruska together with Expats Uttam and Budu Rai and from Chupar living in the United States who returned to Nepal to guide the reconstruction of the school and the community they were from. Helping John were also two American friends, who became known as "The Three Musketeers," David English and Neil (Sandy) McKay. "For rebuilding, we are excited about a construction technique called “gabion banding” that re-uses the abundant stone left over from the earthquake. Gabion banding, along with traditional mud/stone masonry, avoids the need for expensive materials and scarce local timber, while greatly increasing earthquake resistance. 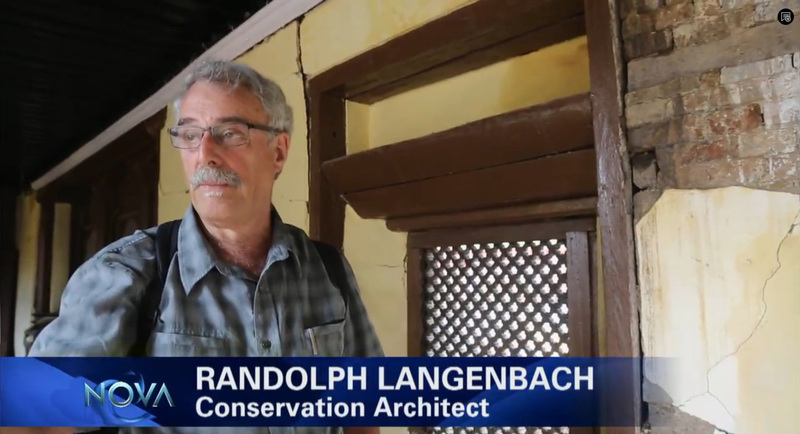 Read and watch a video about the technique developed by restoration architect Randolph Langenbach, author of “Don’t Tear it Down!” at http://www.traditional-is-modern.net/Nepal.html. 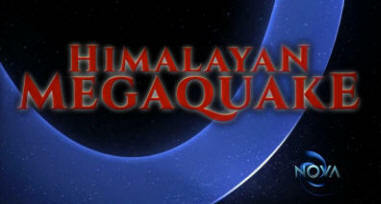 It will be featured in a NOVA film to be aired on PBS early next year. Volunteers are currently designing structures for the village that incorporate this technique." Stone Masonry Model constructed and Filmed by Randolph Langenbach as rough representation showing collapse mechanism of rubble stone masonry. Click on the cover images to download PDFs of these reports. 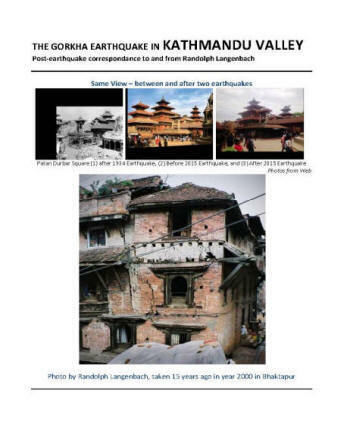 The report on the LEFT was written 2 weeks following the April 25th 2015 earthquake. It describes the first reported and photographed evidence of the performance of buildings with and without timber bands (ring beams) primarily from the evidence at the Hanuman Dhoka Palace in central Kathmandu. 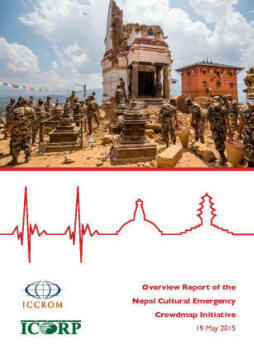 The report on the RIGHT includes the sequence of correspondence beginning just 3 days after the April 25, 2015 Gorkha Earthquake leading up to the creation of a detailed report. 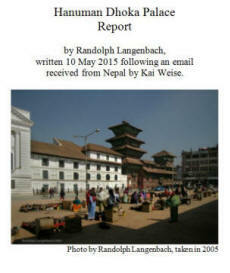 These emails and the detailed reports were originally circulated to Nepali and ICOMOS colleagues. Neither of these documents have been modified subsequent to Prof. Langenbach's visit to Nepal in August, 2015. 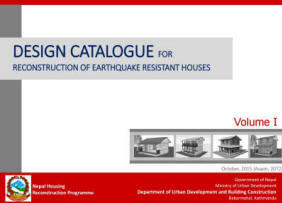 "DESIGN CATALOGUE FOR RECONSTRUCTION OF EARTHQUAKE RESISTANT HOUSES"
If for some reason, that link des not work , to download this volume from this website. NOTE: These Designs in Volume 1 have already been approved for reconstructions. 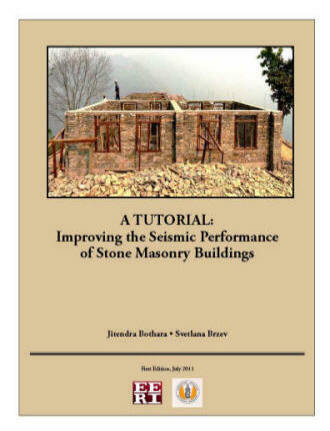 NOTE: Co-author Seismic Engineer, Jitendra Bothara, is originally from Nepal, which gives this book particular relevance to Nepalese stone construction. This CCTV video, which Seismologists D.Mencin and R. Bilham have keyed to a plot of the Gorkha earthquake motion in the Kathmandu Basin,is the most revealing, as the camera recorded the people being thrown from side to side. The video plays the CCTV full frame image first, and then follows it with the CCTV image shown together with the plot. Gorkha (Nepal) Earthquake: PEER Strong Motion Records, Server Room Video. 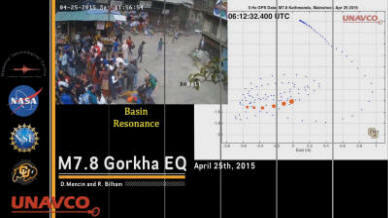 PEER has processed strong motion records for the main shock of the Gorkha (Nepal) Earthquake which occurred on April 25, 2015. The source records are from the KATNP (USGS) station and have been processed using PEER’s standard data processing method (Ancheta et al. 2013). Pair the data above with this video of a Server Room (courtesy of Exponent/Failure Analysis Associates) recorded during the main shock of the April 25, 2015 Gorkha (Nepal) earthquake.The video was recorded on the fifth floor of a 7-story tall reinforced concrete moment frame building located in Kathmandu, Nepal, at a site about 2000 feet from the KATNP (USGS) strong motion recording station, and appears to reflect the one-sided displacement pulse effect. Typical column spacing was approximately 16 feet on-center with masonry infill walls around the perimeter. The building reportedly suffered no structural damage – observed damage included very minor cosmetic damage to infilled walls, and damage to suspended ceilings on the top floor. As Human Crisis Takes Priority After Nepal Quake, a Nation’s Treasures Become Its Scrap. Christian Manhart is quoted in this article. 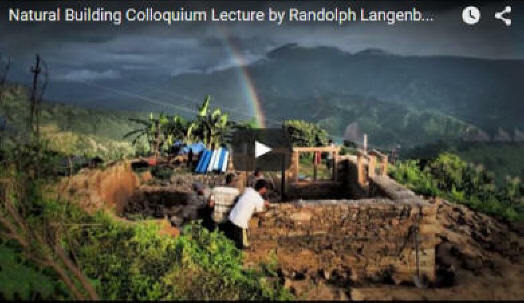 Video by Jared Smith, Seattle Structural Engineer, showing the rebuilding of stone houses high in the mountains remote from access to cement and steel. It also includes interview of woman who describes having been in her house when it collapsed in earthquake.